William Edward "Eddie" Royal (born May 21, 1986) is an American football wide receiver and return specialist for the Chicago Bears of the National Football League (NFL). He was drafted by the Denver Broncos in the second round of the 2008 NFL Draft. He played college football at Virginia Tech. Royal has also played for the San Diego Chargers. Royal first attended South Lakes High School and Paul VI Catholic High School before going to Westfield High School in Chantilly, Virginia, where he played for most of his high school football career. He received All-America honors from PrepStar and SuperPrep (who named Royal the top high school player in the state of Virginia). He also earned Washington Post All-Metropolitan player of the year, 1st team All-met, 1st team All-state, 1st team All-region and 1st team All-district honors. While a senior at Westfield High School, Royal, along with future Virginia Tech teammate Sean Glennon and future West Point fullback Max Palmatier and future Penn State running back Evan Royster, led his team to an undefeated season record (14-0) en route to the Virginia Division 6 AAA State Championship. While at Westfield, Royal also competed in track & field. He posted bests of 6.48 seconds in the 55-meter dash and 6.52 meters (21-3.75) in the long jump. 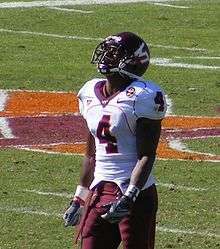 Royal played for the Virginia Tech Hokies from 2004 to 2007. In 2004, Royal received freshman All-America honors from The NFL Draft Report after hauling in 28 passes for 470 yards (16.8 avg.) with three touchdowns in 12 games (11 starts) as a true freshman. Returned 25 punts for 274 yards (11.0 avg.) and gained 346 yards on 12 kickoff returns (28.8 avg.) and totaled 1,101 all-purpose yards. Royal started all 13 games as a sophomore in 2005, finishing third on Virginia Tech with 27 receptions for 315 yards (11.7 avg.) with two scores while adding 10 rushes for 79 yards with one touchdown. He returned 32 punts for 263 yards (8.2 avg.) and 14 kickoffs for 293 yards (20.9 avg.) to account for 950 all-purpose yards. Royal played 13 games (9 starts) during his junior year in 2006 and picked up second-team All-Atlantic Coast Conference honors while being named an honorable mention All-American by Sports Illustrated. Royal caught 31 passes for 497 yards (16.0 avg.) with three touchdowns, he led the ACC and ranked 12th in the nation with a 13.2-yard punt return average (23-304) with one touchdown. He added 431 yards on 19 kickoff returns (22.7 avg.) and five rushes for 24 yards. He threw a 53-yard touchdown on a trick play against Georgia Bulldogs in the Peach Bowl. Royal finished with 1,256 all-purpose yards (96.7 ypg.). Royal during his tenure at Virginia Tech. He played 13 games with 11 starts in 2007, earning first-team All-Atlantic Coast Conference honors and second-team All-America accolades from The NFL Draft Report, he posted career highs in receptions (33-496) and receiving touchdowns (4). Led the ACC and ranked 10th in the nation with a 14.7-yard punt return average (31-455) and scored two touchdowns on punt returns. He Added 14 kickoff returns for 316 yards (22.6 avg.) and eight rushes for 112 yards (14.0 avg.). Finished with 1,379 all-purpose yards (106.1 ypg. ), he finished first in career all-purpose yards in school history (4,686), fourth in career receptions (119), fifth in receiving touchdowns (12) and sixth in receiving yards (1,778). He was also the Atlantic Coast Conference's (ACC) all-time leader in punt return yards (1,296). Royal received second-team All-ACC honors in 2006 and first-team All-ACC honors in 2007. The Hokies won the Coastal division and secured a bid the 2007 ACC Championship Game in Jacksonville, Florida, there, they faced a rematch with Boston College, champions of the Atlantic Division. Matt Ryan was unable to seize the victory with two fourth-quarter interceptions, sealed the Hokie win and an automatic bid to the Orange Bowl game. Royal finished the game with 4 receptions, 63 yards and 1 TD. He also played in the 2008 Orange Bowl. Royal majored in sociology. Royal was drafted in the second round (42nd overall) of the 2008 NFL Draft by the Denver Broncos. Royal started and played in his first NFL regular season game on September 8, 2008 in a 41-14 road win over the Oakland Raiders. He caught nine balls for 146 yards and one touchdown in his debut. Royal's 146 receiving yards were the most by any wide receiver in the first week of the 2008 NFL regular season. His nine receptions were the most by a rookie making his debut for the Broncos. Royal's first career touchdown catch came in the first quarter of the game on a 26-yard pass from former Broncos quarterback Jay Cutler. Royal's opening week performance yielded voters on NFL.com to select him as the Diet Pepsi NFL Rookie of the Week out of five finalists. The versatile Eddie Royal played four seasons for the Broncos. Royal is pictured at a game in December, 2009. In Royal's second game of the season, he caught five passes for 37 yards and one touchdown, as part of a 39-38 Broncos home win over the San Diego Chargers. His touchdown catch came with 24 seconds left in the game on a 4th and 4 from San Diego's four-yard-line. The catch made the score 38-37 Chargers; however, the Broncos subsequently went for a two-point conversion, in which Royal caught a pass from Cutler, thus, giving the Broncos a one-point victory. In Week 10, a game in which the Broncos defeated the Cleveland Browns on the road in comeback fashion, 34-30, Royal caught six passes for 164 yards, including a 93-yard touchdown pass. The performance earned him the honor of Diet Pepsi NFL Rookie of the Week for the second time in his career. On November 30, 2008, in a 34-17 Broncos road victory over the New York Jets, Royal set a franchise record for most touchdowns (5) and receiving yards (757) for a rookie in one season after catching five passes for 84 yards and a touchdown. Eddie's 91 receptions are second most in NFL history for a rookie, behind only Anquan Boldin who had 101. His 980 yards and five touchdowns are both Broncos rookie records. He was seventh in the league among wide receivers in receptions, and sixth in the NFL in total yards. Early in the 2009 season, Royal became the 4th fastest player in NFL history to reach 100 career receptions. On October 19, 2009, Royal became the first player in Broncos history, and only the 11th player to date in National Football League history, to return a kickoff (93 yards) and a punt (71 yards) for touchdowns in the same game, leading undefeated Denver to a 34-23 win over the San Diego Chargers. On March 15, 2012, Royal signed a three-year contract with the San Diego Chargers worth $13.5 million, $6 million of which is guaranteed. He contributed as a slot receiver while handling the team’s punt return responsibilities. But a series of setbacks hampered the beginning of his career in San Diego. Royal suffered a groin injury during the first day of training camp and shortly thereafter, his mom fell ill and he found himself making several trips home to Virginia to be by her side. Despite the slow start in San Diego, Royal finished the year strong and his best games were during the end of the season. In 2013, Royal reunited with new Chargers head coach Mike McCoy, his old offensive coordinator in Denver. Through the first 8 games, Royal was among the league leaders in touchdowns with 7. He finished 2013 with 631 yards and a career high in touchdowns with 8. In 2014, Royal played one of the biggest roles in bringing former Virginia Tech teammate and Kansas City Chiefs cornerback Brandon Flowers to the Chargers. Royal, along with his teammates, sold Flowers on the city and fans. They emphasized how they were trying to build something great and how he'd be another piece to the puzzle. On March 11, 2015, Royal signed with the Chicago Bears. In 2015, Royal had just 37 catches for 238 yards and one touchdown, after signing a three-year, $15 million deal with $10 million guaranteed. On September 11, 2016, Royal caught his first touchdown of the season against the Houston Texans. On October 2, 2016, Royal caught 7 passes for 111 yards and a touchdown against the Detroit Lions, his first 100+ yard game since 2014. As well as catching a touchdown pass, Royal also caught a single pass for a 64-yard gain. Royal's older brother, Chris Royal, played professional football as well, and is a defensive backs coach at Lindenwood University. His sister, Capt. Christina Royal, is a graduate of the Virginia Tech Corps of Cadets where she served as regimental commander and now serves with the United States Air Force. 1 2 3 "Official Site of the Denver Broncos". Denverbroncos.com. July 8, 2010. Retrieved July 15, 2010. ↑ "Denver Broncos vs. Oakland Raiders - Recap". ESPN. September 8, 2008. Retrieved July 15, 2010. ↑ "San Diego Chargers vs. Denver Broncos - Recap". ESPN. September 14, 2008. Retrieved July 15, 2010. ↑ "Denver Broncos vs. Cleveland Browns - Recap -". ESPN. November 6, 2008. Retrieved July 15, 2010. ↑ "Denver Broncos vs. New York Jets - Recap". ESPN. November 30, 2008. Retrieved July 15, 2010. ↑ Wilson, Bernie (October 20, 2009) "Royal's TD returns help Broncos top Chargers 34-23" The Denver Post. Retrieved October 20, 2009. ↑ Gehlken, Michael (March 15, 2012) "Chargers make Royal addition at receiver" "UT San Diego". Retrieved March 15, 2012. ↑ Mayer, Larry (March 11, 2015). "Bears ink free agents Royal, Rolle". ChicagoBears.com. Retrieved March 12, 2015. ↑ Dickerson, Jeff (January 3, 2016). "Jay Cutler up, Martellus Bennett down in Bears' 2015 season". ESPN.com. Retrieved January 28, 2016. ↑ Wiederer, Dan (2016-10-02). "Eddie Royal's big gain, big day help lift Bears to first victory". Chicago Tribune. Retrieved 2016-10-02. 1 2 3 "Eddie Royal Stats". ESPN Internet Ventures. Retrieved 28 January 2016. ↑ "Virginia Tech-Marshall to be a Royal affair". USA Today. October 8, 2005. Retrieved March 25, 2010. Wikimedia Commons has media related to Eddie Royal.